The AM Trade Copier is a forex expert advisor by AMForexCopier.com. 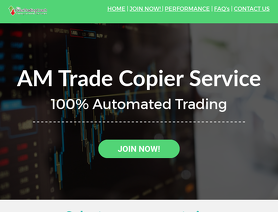 The AM Trade Copier automated forex trading software for the MetaTrader platform has been forward tested on a live account by ForexPeaceArmy. The AM Trade Copier forex robot works with all MT4 broker. AM Trading is a 100% fully automated trade copier service where you can have your own MT4 account mirror my own account. This is carried out through 3rd party software. The setup is a simple, one-off 5 minute process. You don't need any VPS or software and you don't need to have your computer or platform open. There is the option to mirror the master account risk or you can increase the risk if required. The trades are all taken by my own collection of algorithms. The master account is constantly monitored, risk is kept low and the rewards are consistent. Today the copier sits at -(22.28%) Gain, -(68.22%) drawdown. - NZ ($4,452) profit. There is a open trade AUDCAD with no stop loss in sight and already negative 422 pips. AUDNZD is sitting at negative 472 pips and was open on the 21 August 2018 coming up to the fifth month it has been a open trade. Jan 5, 2019 - 1 Star The results speak for it self. I have been following for 12 months and lost half of my account plus payed the monthly fees . Andrew himself is a nice person but all these forex copiers are run by their robot systems . They do their best to code their own trading style and this has not worked out for most of them. I would not follow or trust any one after been slaughtered by AMForexCopier . i was considering buying the trading course but not any more. Even at a 150% mirror using a US broker, I did get 2 margin warnings when my margin level dropped below 120% (30+ open trades). However, I never dropped below 100%. Aug 18, 2018 - 5 Stars I started the service 6 weeks ago. I am located in the U.S. and my broker is Forex.com. The amounts represented are after the monthly cost for the service and costs for open trades using a margin account. I have been very happy with the results so far but it has been quite a ride the last 6 weeks. I originally began trading at a 100% mirror. I increased it to 200% and then 300% temporarily. While asleep one night, I got a margin warning when my margin dropped below 120%. I immediately dropped the mirror to 200%. I went a while without problems but this week I received the same margin warning so I dropped the mirror back to the out-of-the-box 100%. After communicating with Andrew and Forex.com, it was clear that leverage was the problem. Using a U.S. broker, I am stuck with 50:1 leverage. Andrew confirmed that the trade copier master was set at 100:1. Because I'm maxed out at 50:1 leverage, I am forced to reduce my mirror in half. I have now settled on a 150% mirror and continue to test with good results. My next logical step is to move to different broker like FXChoice or Tradersway - one that offers 100:1 leverage and hedging. Great to see the results you are getting. An average of +3% gain per week is not too bad! Thanks for sharing this with everyone and we look forward to continuing the same consistent results for you. i started the service 4 months ago. i lost several thousand dollars the first three months. didn't match what i saw on his site. I was using forex.com in the U.S. and they don't allow hedging. i changed to another broker, Traders Way, which allows hedging. Now it is working correctly and making money. have changed today from 100 percent mirror to 200 percent mirror to double the risk, but with what i have seen so far, it looks like a good risk. Hi Mark, it's great to see you are enjoying the service and you are making money. Yes, for US clients selecting a broker who allows hedging is important for my copier - Traders Way and FX Choice seem to be good options.